Hardcover, 12.25 x 9.5 in. / 160 pgs / illustrated throughout. Photographer Joan Myers (born 1944) is perhaps best known for her recent images of the forbidding Antarctic landscape. 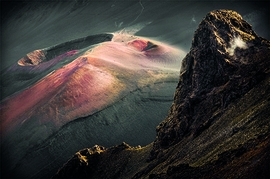 In this new publication, Myers turns her attention to volcanoes, photographing iconic sites from around the world: Volcano National Park on the island of Hawaii, Lanzarote in the Canary Islands, Ecuador's Cotopaxi and Picincha, Mt. Erebus in Antarctica, Krakatoa in Indonesia, Mt. 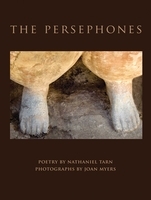 Etna and Pompeii are all included in this breathtaking volume. 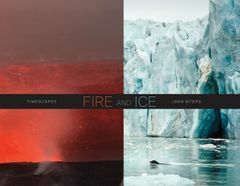 Myers' essay reads like an adventure story, exploring the connection between fire and ice while describing her thrilling treks to the ends of the Earth. "We like to imagine Earth as a ball," she writes, "a brightly-colored dime-store globe with countries and oceans drawn on its glossy surface. We forget that its surface slides, subducts and transforms, setting off earthquakes and volcanic eruptions … A stable earth, whatever we would like to think, is an illusion." Featured image is reproduced from Joan Myers: Fire and Ice, Timescapes. In conjunction with the skillful printing of Damiani they are a visual feast in which virtually every page contains an image that can only be described as exceptional, both in its photography and printing. They leave you shaking your head in disbelief that such vistas exist, and grateful that Myers has recorded them. FORMAT: Hbk, 12.25 x 9.5 in. / 160 pgs / illustrated throughout.